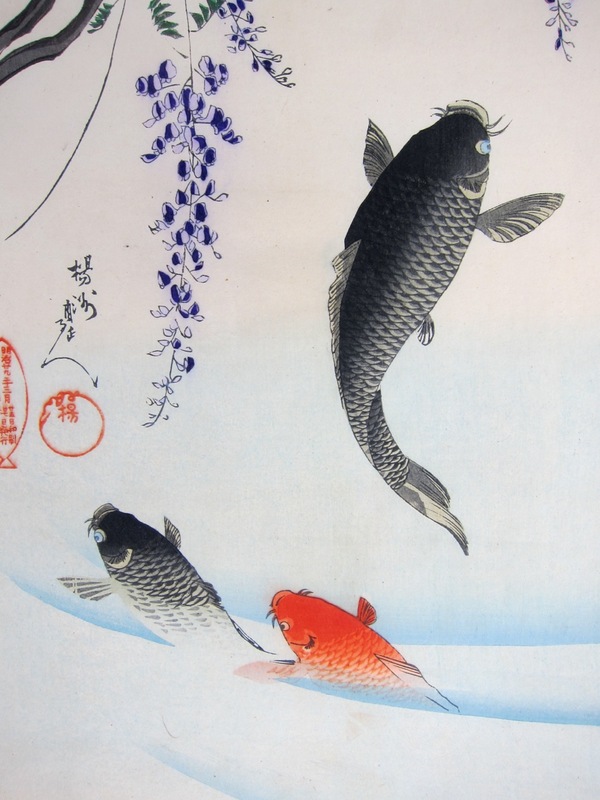 Toyohara Chikanobu (1838 - 1912) Carp Jumping out of the Pond under a Wisteria Tree at the Chiyoda Palace (Chiyoda Ooku Ohanami), 1894. Oban triptych. This perfect and exquisite print, the delicate survivor of earthquake, fire and world war is a picture of longing… longing for a delicate and refined past by an artist obsessed with the pace of change, intrigued by the present and drawn to a disappearing history. The Palace itself is the Chiyoda Palace or Edo Castle as it was known. It was built in 1457 by the warrior Edo Shigetsugu in what is now the Honmaru and Ninomaru part of the Castle. It later became the seat of the old Tokugawa shogunate who rebuilt it in 1593 and completed it in 1636, but after centuries of power and total domestic and military dominance, the old regime, weakened and no longer relevant, were required to vacate the old Edo Castle in the revolution of 1868. Like so much of Japan’s past, the bulk of the medieval castle was pulled down. 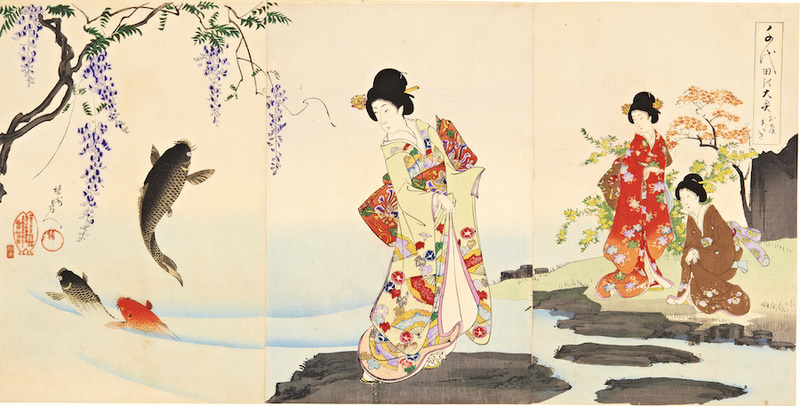 Chikanobu shows an idealised scene of palace maids wandering under flowering wisteria, carp leaping out of the water. These prints of the Chiyoda precincts are very beautiful and quite collectible. They only really shine if like this, they are in outstanding condition. The print is backed with album paper, colour, condition and impression are all fine.